Criterion's splendid edition of Weekend gives insight into the mind of visionary director Jean-Luc Godard, who aimed at nothing less than challenging the dominant social and cinematic paradigms of his time. Jean-Luc Godard was never a director content to live off of typical narrative structures or the cinematic conventions of his time. Though his 1960 breakthrough, A bout de souffle (Breathless), is not unjustly hailed as the nouvelle vague film, it's markedly different from the many noirs that preceded and followed it, especially those of other famous directors of the time, not least Jean-Pierre Melville. Still, despite Godard's unmistakable style, critics typically make a sharp distinction between two periods in his career: the early, (relatively) "commercial" films (A bout de souffle, Bande à part [Band of Outsiders]), and the later, "anarchic" films (Weekend, Tout va bien). While this is helpful in some sense, as there is a playfulness in his early work that faded post-Made in U.S.A, it ignores the crucial fact that Godard was always an anarchistic director. Tropes can be found in any one of his films, but the way in which he eschews them makes him one of cinema's unmistakable radicals. That he shot Film Socialisme, his most recent piece, in large part on cell phone cameras, is evidence of the subversion of typically understood filmmaking on his part. Whenever a cinematic convention appears during any of his films, one can’t help but get the feeling that he’s at the very least winking at the audience, if not showing them how absurd such tropes really are. Weekend, released in 1967, is the central transition piece between the two aforementioned periods. Though overtly philosophical in ways his previous material wasn’t, it still carried vestiges of the bright color palette that gave Made in U.S.A the wonderful appeal it had. Gary Indiana, a critic who contributes an essay to the thick booklet that accompanies the DVD, notes that as Godard’s career progressed, his movies became “more like Marxist-Leninist slide lectures than movies”, and the important of Weekend’s function is providing a gateway to these political works, rather than serving as a transition shock between two distinct periods. While there are many inspired things about Weekend, its main success comes in its ability to take highfalutin pontification and turn it into engaging cinema. Godard is no stranger to abstract art, but rather than just making all the visuals here obvious ciphers for some general theory, the images resonate with deep meaning. Without these images, the many ideas brimming from the script couldn’t come across in the way they did. Works like A bout de souffle, Bande à part, and Alphaville are delightful to this day, but nothing feels essentially Godardian more than Weekend does. Godard’s writing, best summarized as radical satire that takes no prisoners, is also in top form. Though there's no real plot to speak of, and much of the dialogue is ethereal philosophizing rather than character development, all the criticisms in Weekend hit home. Godard aims at nothing less than showing the absurdity of the life created by capitalism and its subsequent effects on the nature of film practice. He makes this criticism hit hard with a liberal usage of gallows humor, here used to depict the bloody and fiery deaths of those who threaten the system or are no longer of any use to it. There are events that set this heady criticism in motion. The “plot”, if one can even use that word in describing Weekend, is bare-bones: Corinne and Roland, a wealthy couple, played by Mireille Darc and Jean Yanne, take a trek to collect a large inheritance from a relative they’ve waited for far too long to die. Upon leaving “civilized society”, however, they find a country landscape savaged by traffic jams, bloody accidents, and constant violence. The satirical element of the movie is at its best here; in capitulating to the right end of the extreme of social contract theories—specifically the Hobbesian view of human nature, in which life is “nasty, brutish, and short”—Godard shows how childishly the wealthy of his time viewed the proletariat. The class divide is depicted in many distinct ways in Weekend, but it's especially evident in the heavy presence of cars; in its own way, it' s one of the greatest car movies of all time. The choice of car as the repeated item is quite deliberate; the car, remember, was the impetus for the creation of the assembly line by Henry Ford, the ultimate capitalist. Insofar as cars are still the de facto means of transportation in developed countries with anything resembling a highway infrastructure, the key to car manufacturing is mass production. What begins as a basic human need—transportation—morphs into exploitation as companies design cars exclusive to particular clients. Roland and Corinne can afford a nice convertible, but the farmer who killed the bourgeois woman's boyfriend is left with an old tractor. Freedom of movement, ostensibly a fundamental human right, has because of the capitalist engine become a tool of oppression. Witness as a young bourgeois woman and her boyfriend get into a car accident after rounding a corner into a middle-class farmer's tractor, resulting in the death of the boyfriend. Though understandably upset, what fuels the woman's ire is not the loss of her boyfriend, but instead, class hatred. Her outrage is legitimized by law—"He had right of way!" she cries, to disinterested onlookers—and entirely pushes away any of the wrongdoings she herself admits in her tirade, not the least of which is her admitted fact that she had only gotten the car by sleeping with the man driving it. By her logic, we might consider that she is just as much a "moocher" from the wealthy as she presumes the farmer is; she just happens to get more perks. Not only does the system provide the wealthy better transportation, it also legitimizes the abuses stemming from that privilege. The fact that what happened was a car accident and not killing with malice aforethought does not matter to the woman; a death caused by the lower class, whether intended or not, will always be viewed as an abomination by those who do not understand the experience of the oppressed. This encounter is but one of many scenes of violence in Weekend. Dead bodies are almost constantly seen on the country landscape Corrine and Roland attempt to make their way through. The film’s most famous sequence, a long, single tracking shot that follows a traffic jam on a small country road, ends with Corinne and Roland blitzing their way past a bloody, horrific accident that left several people dead, their bodies and blood smears on the side of the road plain for the world to see (if one will only look). The dark humor with which the two leads shrug off the brutal accident at the end of this single shot reveals much about what capitalism prioritizes and does not prioritize. "My Hermes handbag!" a woman cries as she watches her car burn in a three-way pileup engulfed in flames later in the film. What's striking about the violence of Weekend is not the violence itself, but how it's depicted. There are so many scenes involving combat scattered throughout that it's hard to keep count, but they're underplayed in a darkly comedic way that reflects the inevitable end of capitalism. This is truly the ultimate purpose of the single-shot traffic jam scene: why stop to help those with broken-down cars or to comfort those disturbed by the bodies littering the landscape when those things are bound to happen, anyways? For Corinne and Roland, this is nothing more than, to borrow a more recent term, "collateral damage": juxtapose the scenes with dead bodies alongside those with abandoned cars left to burn and the result is the same. "The system", however it might be explicated, necessitates the death of its products, whether it be the capitalists themselves or the products they produce. Given the unabashed way in which Godard associated himself with Marxism early on, this anti-capitalist critique will be unsurprising for the majority of viewers. 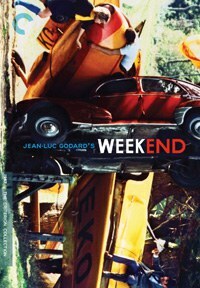 Rather, the true radical criticism provided by Weekend is, as the credits declare, “the death of cinema.” The trajectory Godard had set for himself prior to this work forms the many pieces that constitute the logical syllogism of Weekend; his characters became increasingly abstracted as his filmography grew, reaching their almost purely abstract peak in this movie. Joseph: Durand's your husband's name. What's yours? Corinne: My maiden name? Corrine Dupont. Joseph: Dupont's your father's name. What's yours? Joseph: You see, you don't even know who you are. Christianity is the refusal of self-knowledge, the death of language. Joseph's claim that Christianity inherently creates denial of the self is reflected in the nature of the people onscreen. Corinne and Roland aren't fleshed out characters, and the majority of the "crazy people" Roland complains of usually appear to trumpet ideas, not to give some significant psychological reflection. For Godard, the folks of Weekend are not just the logical extension of the development of his oeuvre; they’re the natural consequence of what film has done to human beings. Instead of merely throwing hollow characters out in front of the camera, however, he uses the result of cinema’s “unreality” to express the meaningful alternatives to character death. Joseph’s deconstruction of patrilineage and patriarchy seen above is one of these alternatives: only when we begin to cease assuming the names we are given reflect who we are will we be able to find our true selves, the ones unencumbered by coercive forces re-inscribed by biopower. The many delightful metafilm jokes sprinkled throughout contribute to this thesis even further. After encountering two people in the woods, including a woman that seems rather like Alice in Wonderland, Corinne sternly tells these philosophizing drifters, “This isn’t a novel, it’s a film. A film is life.” But this exactly the Alice character’s point: “imaginary characters” (Roland’s words) are real, and that the notion of neatly drawn characters with precisely understandable motives toward some utilitarian goal is not a normative reflection of real life. When a random driver asks, Roland, “Are you in a film or in reality?” the metafilm game is up: only upon renouncing the notion of film-as-distinct-from-life will film actually reflect life. This is not to say there cannot be suspending of disbelief, but rather that to abstract and devalue film (and all other art, for that matter) from the political realities of life is to let the dominant political schemes and narratives seep into film, overtaking it in the process. From these endlessly deep philosophical themes, it’s easy to see how Weekend, even for Godard, is not a movie in the traditional sense. This, of course, is exactly what he wants: what better way to show the death of cinema than to present a new vision of it? Since Godard is anything but a dime a dozen in the great pantheon of directors, most have not taken heed of his message. As it stands now, Weekend is a prophecy unfulfilled: despite this supposed death of cinema, films like the kind Godard rails against are still around. With his once-prolific oeuvre now diminished, undoubtedly by his increasing age, Godard’s critical voice isn’t as present as it was during the nouvelle vague, but it’s not difficult to imagine that he’d find plenty to still be discontent with. The proverbial bodies are still hitting the floor, and I’d like to think he’s laughing off the rest of the world somewhere, content with the work he’s done. Criterion’s thorough edition of Weekend lives up to the label’s already prestigious standards. The transfer is near-pristine, and captures the vibrant colors perfectly. Relative to other Criterion featurettes, this release is somewhat sparse—a set of interviews, a video essay, and a television bit featuring Godard from the time of the release—but the f40-page booklet accompanying the DVD is one of the best the label has put out. Amongst its contents is an insightful interview with Godard, which goes into greater depth about Godard’s views on anarchism as it relates to film.